The power of exceptional service...all copywriters (and everyone) take note. Noticed this sign today in my local shopping center. It's on the door of Blackhawk Hardware, a local independent hardware store in Park Road Shopping Center here in Charlotte. This sector is extremely competitive. There's a Home Depot two miles away and a Lowe's about four miles away. And if you're not familiar with Lowe's and the Depot, they are the 400 pound gorillas. Yet Blackhawk Hardware rocks on, having its best December ever. In 38 years. The second you walk in, there's an employee who asks, "how can we help you?" If you need a screwdriver, the person at the front desk directs you to "row 9" and when you get to row 9, there's a screwdriver specialist right there who will show you all the screwdrivers, including the "house" brand which provides excellent value. Yes, you might save a tiny bit at Lowe's or Home Depot but, if you're like me and hate shopping for screwdrivers, Blackhawk provides a fast and easy "shopping experience." And there's more...if you buy something like several bags of manure, there's a person at Blackhawk who will load the car and they will even deliver. It's like the owner is constantly asking, "how can I make life easier for my shoppers?" I've been to Home Depot and the service is appalling and it takes 20 minutes to check out sometimes. I hope I offer a Blackhawk level of service to my clients. Every copwriter should strive to make life as easy as Blackhawk...look at the results. When I rewrite a web site or start one from scratch, I always include an FAQ page. Here's mine. Here's a new web site I wrote for a client in Australia; their FAQ page is here. Note the 'accordion' design...something I want! The benefits of an FAQ page. Qualify prospects. Keep cheats and 'Wal Mart ' shoppers well away. Address possible objections. Again, people will not waste your time asking the same questions over and over. Additional salient content. You can never have enough. Further highlights additional features your client will find important. You can also wedge in valuable social proof. Answer a question like..."Is property investment for me?" with "The Wall Street Journal recently wrote..."
I cringe when I hear people say..."nobody ever reads" or a "picture is worth a thousands words." When someone is really interested in what you have to offer, provide them with plenty of information. A well-crafted and meaty FAQ page packed with facts and direct answers will help you generate more leads and sell more. Include the question "What will this cost?" because this will keep people who will not pay you away. I'm always paying close attention to copy. Everywhere. Not just when I'm working on assignments. I even look at 'local' advertising for yard sales, bands, lost dogs...you know, the signs people put up around the neighborhood. We've had a cold winter (for North Carolina) so there's a solid demand for firewood. Here's a sign from a would-be firewood vendor. Good timing with the snow everywhere but there's illegible red pen on a cardboard background. I see design and copy this bad all the time...even from big agencies. If you want to avoid advertising this bad, use direct response techniques. One of these...black type on a white background. If it's print, use a serif font (Times, Garamond). If it's web, use a sans-serif font (Arial, Helvetica). I can't comment on the copy: I can't see it! Copy, what there is of it, cannot be seen, even from three feet. The person is trying to sell firewood. I see copy and design this bad all the time. Avoid this type of disaster by using direct response techniques. Follow the 'rules' of direct response design as well as the 'rules' of direct response copywriting. I'm Scott Martin, a direct response copywriter. 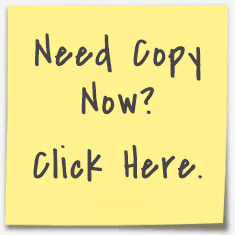 For my website, go here and make sure you request my free direct response copywriting checklist. As a copywriter, I'm a small business owner and, as such, I have to market myself successfully. Unfortunately, I've heard this from a boss or two! And it's because I've handed them news about a bad surprise. I'm not a huge fan of my electric company, Duke Energy. It's a monopoly sponsored by the federal government and the state government. I have a client in Australia and I wrote the copy for this landing page (currently getting an 80 per cent click through); I learned that, in Australia, they have a choice when it comes to which electricity company they want to choose. I have a small house yet my bill is stratospheric, especially in the summer. How I wish I could move my house to Australia. The power company offered me a pleasant surprise for a change...15 of these eco lightbulbs for free. What are you doing to surprise your clients? Pleasantly, of course! When paying my insane Duke Energy bill online, I got a pleasant surprise...an offer for 15 free lightbulbs. They arrived yesterday and I'm delighted. That's about $100 in value. I just added to my monthly marketing checklist: Pleasant Surprise (like lightbulbs). As a direct response copywriter, I'm always trying to follow my direct response copywriting checklist...headline...guarantee...benefits, etc...here's something to add: good surprise.